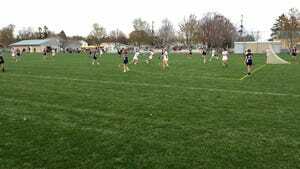 For the first seven years of its existence, the New Oxford girls' lacrosse team didn't have much to celebrate. From the program's inception in 2008 through the 2014 season, the Colonials were generally one of the weakest teams in the YAIAA. They posted seven straight losing seasons and won only eight games in a six-year stretch at one point. Now, New Oxford has posted two straight winning seasons and is headed to the District 3 playoffs for the first time. After going 9-7 last season, the Colonials (10-5) finished off the best regular season in their history Wednesday by beating Spring Grove at home, 22-12. Having struggled for so long, the Colonials are ready to celebrate. "It's excellent," head coach Jessica McIntyre said. "To have a team this close, that's such a family, do this for this school it's such an awesome experience. We always come up with goals before the season, and our main goal this year was to make districts." McIntyre has been with New Oxford since the beginning, having started the program back in 2008. According to her, the team's success the past two years can be attributed to years of developing players and growing the sport in the community. When New Oxford first launched its program, most of the players had never picked up a stick before. Now most of the girls play on club teams and participate in team workouts during the offseason, McIntyre said. New Oxford also started its own youth league two year ago. "I get them in as many tournaments as I can during the fall and hold workouts, and it's helped a lot," McIntyre said. "Just extra little things, and they work hard." Also, having arguably the best player in the league hasn't hurt. Two years ago, star midfielder Braxtin Reddinger transferred from South Western to New Oxford and immediately helped lift the Colonials to a new level. Now a senior, Reddinger currently leads the YAIAA in goals and is headed to the University of Maryland-Baltimore County next season. McIntyre admits there is a strong correlation between Reddinger's arrival and New Oxford's two winning seasons. Still, the coach said the team is more than just one player. "It's nice to have that go-to player, that extra coach on the field," McIntyre said. "To other girls, she's the role model. But all the girls buy in to teamwork and playing to the best of their abilities. They want to work hard." Reddinger credited her teammates with helping New Oxford make the district playoffs by raising their level of play throughout the season. She added that she's enjoyed helping put the Colonials on the map these past two seasons. "(The last two seasons) have given New Oxford a name as a program and helped people realize this isn't a team you can take it easy on," Reddinger said. "We honestly thought last year was the year to (make the playoffs) but this year we're just a totally different team, and it's just an awesome feeling to be going to districts." The Colonials hope making the playoffs isn't the last goal they accomplish this season. While New Oxford struggled against the YAIAA's best teams (York Catholic, Red Lion, Susquehannock), Reddinger feels confident the Colonials can make a run. One of only two seniors on New Oxford along with Baliegh Tyler, Reddinger said having potentially only one game left in her high school career has kept her motivated. "I don't want it to be over just yet," she said. "I'm excited for college but I don't want high school to end right now."